Perfect as a recap, or an introduction, these studies open up the foundation of Christianity in a simple, understandable way. Christian beliefs are vital to Christian living. They are the foundation of a healthy relationship with God and others. These 12 studies explore what every Christian should know about God, Christ, the Holy Spirit, human nature, salvation, the church, revelation and the last things. The top-selling LifeBuilder Bible Studies have helped millions of people dig deeper into the Bible, individually and in groups. This revised edition features additional questions for starting group discussions and for meeting God in personal reflection, together with expanded leader's notes and an extra 'Now or Later' section in each study. 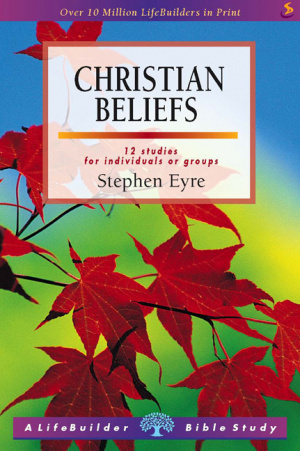 Lifebuilder Bible Study: Christian Beliefs by Stephen D. Eyre was published by IVP in May 2001 and is our 1605th best seller. The ISBN for Lifebuilder Bible Study: Christian Beliefs is 9781859994818. Be the first to review Lifebuilder Bible Study: Christian Beliefs! Got a question? No problem! Just click here to ask us about Lifebuilder Bible Study: Christian Beliefs.